Bridge Academy Film Institute is established by Chennai Film Making Industry leaders and Our Film Institute Providing professionals Film Making courses training with over 18 years of experience in the field of Film Industry. Our Film Institute Offering Film Making Related course in chennai Such as Digital Film Making course, Sound Engineering Course, Photograpy course, Film Editing Course, Digital animation course, website designing and development, and E-learning initiatives. Our excellence in the field of Film industry has empowered us to develop a comprehensive Film Institute training center for all Film Industry related studies under Our Film Institute. Bridge Academy is an ISO certified Film institution in Chennai that's aims to bridge the gap between the raw Film making creativity talent of individuals and Film industry expectations by providing comprehensive and Film industry specific courses. Film Institute of Bridge Academy is backed up by Film Industry experienced professionals from Leading Film Industries Celebrities and their expertise in consulting various forms of Latest Film Technology. 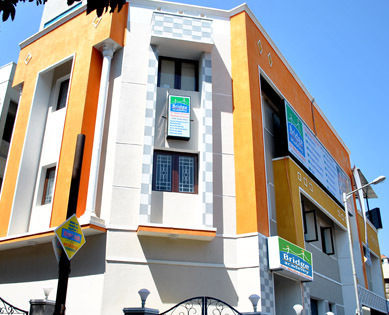 Bridge Academy film institute Located in Chennai that was incorporated with a mission to address a common national problem, growing number of unemployables in our educated youth due to lack of employability skills. Senior Film Making professional and Chennai film industry captains from Film Education and Media industry with a combined experience of more than a decade created Bridge Academy Film Institute to make them employable. The Vision of Bridge Academy film institute is to be the leading school for Film Related studies in nurturing talent & creative minds thereby ensuring Film and media related job opportunities in the world of Media. It is based on the simple philosophy that BETTER EMPLOYEES MAKE BETTER NATION. Our Bridge Academy Film Institute in Chennai enables individuals with high-class Film Industry professional experience in their chosen Film Related course Such as Sound Engineering Course, Digital Film Making course, Video Or film Editing Course, Digital Animation Course, Photography Course and Web Designing Course. Film Courses are not just designed to learn and practice but to work with real time Film making projects to get hands on Professional Film Making experience along with learning. Bridge Academy Film Institute constantly upgrade/Latest Film Industry updates Technique /Latest film Technology Related software and Film Making learning materials in line with changes in the industry to match the Film industry expectations. Bridge Academy's Film Institute Student Placement cell (SPC) is a dedicated department engages in identifying right Film Related job opening for right candidate. SPC validate student Film making real time projects as experience to enhance more employability skills in Film Industry or Institute. Bridge Academy updated the latest Film technologies and Film course as per industrial need hence acquisition of Film making jobs becomes an easier task. Bridge Academy Film Institute aims that Every individual holds potential to succeed in Film Industries After Pursuing Film related course with our Film Institute, but potential alone is not the end. Potential needs to be converted into performance. Bridge Academy Film Institute faculties are experts in moulding raw potential into exceptional performers in Film Institute Trainers. All faculties in Bridge Academy film Institute are highly Film educated and Film making experienced working in the Film industry with ability to transfer Film making knowledge in an effective way. Bridge Academy Film Institute follows 10% Of Film making Theory and 90% Of practice in Film making With live Project learning methodology enhancing learners to experience hands.